This invention was made with Government support under Contract No. N00014-99-1-0857, awarded by the Office of Naval Research. Some background research was supported by the U.S. Department of Energy for 1992 to 1993. The Government has certain rights in this invention. The invention relates generally to the field of plasma physics, and, in particular, to methods and apparati for confining plasma. Plasma confinement is particularly of interest for the purpose of enabling a nuclear fusion reaction. Fusion is the process by which two light nuclei combine to form a heavier one. The fusion process releases a tremendous amount of energy in the form of fast moving particles. Because atomic nuclei are positively charged - due to the protons contained therein - there is a repulsive electrostatic, or Coulomb, force between them. For two nuclei to fuse, this repulsive barrier must be overcome, which occurs when two nuclei are brought close enough together where the short-range nuclear forces become strong enough to overcome the Coulomb force and fuse the nuclei. The energy necessary for the nuclei to overcome the Coulomb barrier is provided by their thermal energies, which must be very high. For example, the fusion rate can be appreciable if the temperature is at least of the order of 104 eV - corresponding roughly to 100 million degrees Kelvin. The rate of a fusion reaction is a function of the temperature, and it is characterized by a quantity called reactivity. The reactivity of a D-T reaction, for example, has a broad peak between 30 keV and 100 keV. The first two reactions listed above - the D-D and D-T reactions - are neutronic, which means that most of the energy of their fusion products is carried by fast neutrons. The disadvantages of neutronic reactions are that (1) the flux of fast neutrons creates many problems, including structural damage of the reactor walls and high levels of radioactivity for most construction materials; and (2) the energy of fast neutrons is collected by converting their thermal energy to electric energy, which is very inefficient (less than 30%). The advantages of neutronic reactions are that (1) their reactivity peaks at a relatively low temperature; and (2) their losses due to radiation are relatively low because the atomic numbers of deuterium and tritium are 1. The reactants in the other two equations - D-He3 and p-B11 - are called advanced fuels. Instead of producing fast neutrons, as in the neutronic reactions, their fusion products are charged particles. One advantage of the advanced fuels is that they create much fewer neutrons and therefore suffer less from the disadvantages associated with them. In the case of D-He3, some fast neutrons are produced by secondary reactions, but these neutrons account for only about 10 per cent of the energy of the fusion products. The p-B11 reaction is free of fast neutrons, although it does produce some slow neutrons that result from secondary reactions but create much fewer problems. Another advantage of the advanced fuels is that the energy of their fusion products can be collected with a high efficiency, up to 90 per cent. In a direct energy conversion process, their charged fusion products can be slowed down and their kinetic energy converted directly to electricity. where Ω i is the ion gyrofrequency. Diffusion according to this relationship is called anomalous transport. For fusion conditions, DB / Dc = (1/16)Ω i τ ie ≅ 108, anomalous transport results in a much shorter containment time than does classical transport. This relation determines how large a plasma must be in a fusion reactor, by the requirement that the containment time for a given amount of plasma must be longer than the time for the plasma to have a nuclear fusion reaction. Therefore, classical transport condition is more desirable in a fusion reactor, allowing for smaller initial plasmas. In early experiments with toroidal confinement of plasma, a containment time of Δt ≅ r 2/DB was observed. Progress in the last 40 years has increased the containment time to Δt ≅ 1000 r 2/DB . One existing fusion reactor concept is the Tokamak. The magnetic field of a Tokamak 68 and a typical particle orbit 66 are illustrated in Fig. 5. For the past 30 years, fusion efforts have been focussed on the Tokamak reactor using a D-T fuel. These efforts have culminated in the International Thermonuclear Experimental Reactor (ITER), illustrated in Fig. 7. Recent experiments with Tokamaks suggest that classical transport, Δt ≅ r 2/Dc , is possible, in which case the minimum plasma dimension can be reduced from meters to centimeters. These experiments involved the injection of energetic beams (50 to 100 keV), to heat the plasma to temperatures of 10 to 30 keV. See W. Heidbrink & G. J. Sadler, 34 Nuclear Fusion 535 (1994). The energetic beam ions in these experiments were observed to slow down and diffuse classically while the thermal plasma continued to diffuse anomalously fast. The reason for this is that the energetic beam ions have a large gyroradius and, as such, are insensitive to fluctuations with wavelengths shorter than the ion gyroradius (λ < α i ). The short-wavelength fluctuations tend to average over a cycle and thus cancel. Electrons, however, have a much smaller gyroradius, so they respond to the fluctuations and transport anomalously. Because of anomalous transport, the minimum dimension of the plasma must be at least 2.8 meters. Due to this dimension, the ITER was created 30 meters high and 30 meters in diameter. This is the smallest D-T Tokamak-type reactor that is feasible. For advanced fuels, such as D-He3 and p-B11, the Tokamak-type reactor would have to be much larger because the time for a fuel ion to have a nuclear reaction is much longer. A Tokamak reactor using D-T fuel has the additional problem that most of the energy of the fusion products energy is carried by 14 MeV neutrons, which cause radiation damage and induce reactivity in almost all construction materials due to the neutron flux. In addition, the conversion of their energy into electricity must be by a thermal process, which is not more than 30% efficient. For example, U.S. Patent No. 4,065,351 to Jassby et al. discloses a method of producing counterstreaming colliding beams of deuterons and tritons in a toroidal confinement system. In U.S. Patent No. 4,057,462 to Jassby et al. , electromagnetic energy is injected to counteract the effects of bulk equilibrium plasma drag on one of the ion species. The toroidal confinement system is identified as a Tokamak. In U.S. Patent No. 4,894,199 to Rostoker , beams of deuterium and tritium are injected and trapped with the same average velocity in a Tokamak, mirror, or field reversed configuration. There is a low density cool background plasma for the sole purpose of trapping the beams. The beams react because they have a high temperature, and slowing down is mainly caused by electrons that accompany the injected ions. The electrons are heated by the ions in which case the slowing down is minimal. Other patents consider electrostatic confinement of ions and, in some cases, magnetic confinement of electrons. These include U.S. Patent No. 3,258,402 to Farnsworth and U.S. Patent No. 3,386,883 to Farnsworth , which disclose electrostatic confinement of ions and inertial confinement of electrons; U.S. Patent No. 3,530,036 to Hirsch et al. and U.S. Patent No. 3,530,497 to Hirsch et al. are similar to Farnsworth; U.S. Patent No. 4,233,537 to Limpaecher , which discloses electrostatic confinement of ions and magnetic confinement of electrons with multipole cusp reflecting walls; and U.S. Patent No. 4,826,646 to Bussard , which is similar to Limpaecher and involves point cusps. None of these patents consider electrostatic confinement of electrons and magnetic confinement of ions. Although there have been many research projects on electrostatic confinement of ions, none of them have succeeded in establishing the required electrostatic fields when the ions have the required density for a fusion reactor. Lastly, none of the patents cited above discuss a field reversed configuration magnetic topology. To address the problems faced by previous plasma containment systems, a system and apparatus for containing plasma are herein described in which plasma ions are contained magnetically in stable, large orbits and electrons are contained electrostatically in an energy well. A major innovation of the present invention over all previous work with FRCs is the simultaneous electrostatic confinement of electrons and magnetic confinement of ions, which tends to avoid anomalous transport and facilitate classical containment of both electrons and ions. In this configuration, ions may have adequate density and temperature so that upon collisions they are fused together by the nuclear force, thus releasing fusion energy. In a preferred embodiment, a plasma confinement system comprises a chamber, a magnetic field generator for applying a magnetic field in a direction substantially along a principle axis, and an annular plasma layer that comprises a circulating beam of ions. Ions of the annular plasma beam layer are substantially contained within the chamber magnetically in orbits and the electrons are substantially contained in an electrostatic energy well. In one aspect of one preferred embodiment a magnetic field generator comprises a current coil. Preferably, the system further comprises mirror coils near the ends of the chamber that increase the magnitude of the applied magnetic field at the ends of the chamber. The system may also comprise a beam injector for injecting a neutralized ion beam into the applied magnetic field, wherein the beam enters an orbit due to the force caused by the applied magnetic field. In another aspect of the preferred embodiments, the system forms a magnetic field having a topology of a field reversed configuration. Also disclosed is a method of confining plasma comprising the steps of magnetically confining the ions in orbits within a magnetic field and electrostatically confining the electrons in an energy well. An applied magnetic field may be tuned to produce and control the electrostatic field. In one aspect of the method the field is tuned so that the average electron velocity is approximately zero. In another aspect, the field is tuned so that the average electron velocity is in the same direction as the average ion velocity. In another aspect of the method, the method forms a field reversed configuration magnetic field, in which the plasma is confined. In another aspect of the preferred embodiments, an annular plasma layer is contained within a field reversed configuration magnetic field. The plasma layer comprises positively charged ions, wherein substantially all of the ions are non-adiabatic, and electrons contained within an electrostatic energy well. The plasma layer is caused to rotate and form a magnetic self-field of sufficient magnitude to cause field reversal. In other aspects of the preferred embodiments, the plasma may comprise at least two different ion species, one or both of which may comprise advanced fuels. Having a non-adiabatic plasma of energetic, large-orbit ions tends to prevent the anomalous transport of ions. This can be done in a FRC, because the magnetic field vanishes (i.e., is zero) over a surface within the plasma. Ions having a large orbit tend to be insensitive to short-wavelength fluctuations that cause anomalous transport. Magnetic confinement is ineffective for electrons because they have a small gyroradius - due to their small mass - and are therefore sensitive to short-wavelength fluctuations that cause anomalous transport. Therefore, the electrons are effectively confined in a deep potential well by an electrostatic field, which tends to prevent the anomalous transport of energy by electrons. The electrons that escape confinement must travel from the high density region near the null surface to the surface of the plasma. In so doing, most of their energy is spent in ascending the energy well. When electrons reach-the plasma surface and leave with fusion product ions, they have little energy left to transport. The strong electrostatic field also tends to make all the ion drift orbits rotate in the diamagnetic direction, so that they are contained. The electrostatic field further provides a cooling mechanism for electrons, which reduces their radiation losses. The increased containment ability allows for the use of advanced fuels such as D-He3 and p-B11, as well as neutronic reactants such as D-D and D-T. In the D-He3 reaction, fast neutrons are produced by secondary reactions, but are an improvement over the D-T reaction. The p-B11 reaction, and the like, is preferable because it avoids the problems of fast neutrons completely. Another advantage of the advanced fuels is the direct energy conversion of energy from the fusion reaction because the fusion products are moving charged particles, which create an electrical current. This is a significant improvement over Tokamaks, for example, where a thermal conversion process is used to convert the kinetic energy of fast neutrons into electricity. The efficiency of a thermal conversion process is lower than 30%, whereas the efficiency of direct energy conversion can be as high as 90%. Figs. 1A and 1B show, respectively, the Lorentz force acting on a positive and a negative charge. Figs. 2A and 2B show Larmor orbits of charged particles in a constant magnetic field. Fig. 3 shows the E × B drift. Fig. 4 shows the gradient drift. Fig. 5 shows an adiabatic particle orbit in a Tokamak. Fig. 6 shows a non-adiabatic particle orbit in a betatron. Fig. 7 shows the International Thermonuclear Experimental Reactor (ITER). Fig. 8 shows the magnetic field of a FRC. Figs. 9A and 9B show, respectively, the diamagnetic and the counterdiamagnetic direction in a FRC. Fig. 10 shows the colliding beam system. Fig. 11 shows a betatron orbit. Figs. 12A and 12B show, respectively, the magnetic field and the direction of the gradient drift in a FRC. Figs. 13A and 13B show, respectively, the electric field and the direction of the E × B drift in a FRC. Figs. 14A, 14B and 14C show ion drift orbits. Figs. 15A and 15B show the Lorentz force at the ends of a FRC. Figs. 16A and 16B show the tuning of the electric field and the electric potential in the colliding beam system. Fig. 17 shows a Maxwell distribution. Figs. 18A and 18B show transitions from betatron orbits to drift orbits due to large-angle, ion-ion collisions. Figs. 19 show A, B, C and D betatron orbits when small-angle, electron-ion collisions are considered. Figs. 20A, 20B and 20C show the reversal of the magnetic field in a FRC. Figs. 21A, 21B, 21C and 21D show the effects due to tuning of the external magnetic field B 0 in a FRC. Figs. 22A, 22B, 22C and 22D show iteration results for a D-T plasma. Figs. 23A, 23B, 23C, and 23D show iteration results for a D-He3 plasma. Fig. 24 shows iteration results for a p-B11 plasma. Fig. 25 shows an exemplary confinement chamber. Fig. 26 shows a neutralized ion beam as it is electrically polarized before entering a confining chamber. Fig. 27 is a head-on view of a neutralized ion beam as it contacts plasma in a confining chamber. Fig. 28 is a side view schematic of a confining chamber according to a preferred embodiment of a start-up procedure. Fig. 29 is a side view schematic of a confining chamber according to another preferred embodiment of a start-up procedure. Fig. 30 shows traces of B-dot probe indicating the formation of a FRC. The solution to the problem of anomalous transport found herein makes use of a specific magnetic field configuration, which is the FRC. In particular, the existence of a region in a FRC where the magnetic field vanishes makes it possible to have a plasma comprising a majority of non-adiabatic ions. Before describing the system and apparatus in detail, it will be helpful to first review a few key concepts necessary to understand the concepts contained herein. A particle with electric charge q moving with velocity ν in a magnetic field B experiences a force F L given by F → L = q ⁢ v → × B → c .
The force F L is called the Lorentz force. It, as well as all the formulas used in the present discussion, is given in the gaussian system of units. The direction of the Lorentz force depends on the sign of the electric charge q. The force is perpendicular to both velocity and magnetic field. Fig. 1A shows the Lorentz force 30 acting on a positive charge. The velocity of the particle is shown by the vector 32. The magnetic field is 34. Similarly, Fig. 1B shows the Lorentz force 30 acting on a negative charge. As explained, the Lorentz force is perpendicular to the velocity of a particle; thus, a magnetic field is unable to exert force in the direction of the particle's velocity. It follows from Newton's second law, F = ma , that a magnetic field is unable to accelerate a particle in the direction of its velocity. A magnetic field can only bend the orbit of a particle, but the magnitude of its velocity is not affected by a magnetic field. Fig. 2A shows the orbit of a positively charged particle in a constant magnetic field 34. The Lorentz force 30 in this case is constant in magnitude, and the orbit 36 of the particle forms a circle. This circular orbit 36 is called a Larmor orbit. The radius of the circular orbit 36 is called a gyroradius 38. Usually, the velocity of a particle has a component that is parallel to the magnetic field and a component that is perpendicular to the field. In such a case, the particle undergoes two simultaneous motions: a rotation around the magnetic field line and a translation along it. The combination of these two motions creates a helix that follows the magnetic field line 40. This is indicated in Fig. 2B. where v ┴ is the component of the velocity of the particle perpendicular to the magnetic field. Electric fields affect the orbits of charged particles, as shown in Fig. 3. In Fig. 3, the magnetic field 44 points toward the reader. The orbit of a positively charged ion due to the magnetic field 44 alone would be a circle 36; the same is true for an electron 42. In the presence of an electric field 46, however, when the ion moves in the direction of the electric field 46, its velocity increases. As can be appreciated, the ion is accelerated by the force qE . It can further be seen that, according to Eq. 3, the ion's gyroradius will increase as its velocity does. As the ion is accelerated by the electric field 46, the magnetic field 44 bends the ion's orbit. At a certain point the ion reverses direction and begins to move in a direction opposite to the electric field 46. When this happens, the ion is decelerated, and its gyroradius therefore decreases. The ion's gyroradius thus increases and decreases in alternation, which gives rise to a sideways drift of the ion orbit 48 in the direction 50 as shown in Fig. 3. This motion is called E × B drift. Similarly, electron orbits 52 drift in the same direction 50. A similar drift can be caused by a gradient of the magnetic field 44 as illustrated in Fig. 4. In Fig. 4, the magnetic field 44 points towards the reader. The gradient of the magnetic field is in the direction 56. The increase of the magnetic field's strength is depicted by the denser amount of dots in the figure. From Eqs. 2 and 3, it follows that the gyroradius is inversely proportional to the strength of the magnetic field. When an ion moves in the direction of increasing magnetic field its gyroradius will decrease, because the Lorentz force increases, and vice versa. The ion's gyroradius thus decreases and increases in alternation, which gives rise to a sideways drift of the ion orbit 58 in the direction 60. This motion is called gradient drift. Electron orbits 62 drift in the opposite direction 64. Most plasma comprises adiabatic particles. An adiabatic particle tightly follows the magnetic field lines and has a small gyroradius. Fig. 5 shows a particle orbit 66 of an adiabatic particle that follows tightly a magnetic field line 68. The magnetic field lines 68 depicted are those of a Tokamak. A non-adiabatic particle has a large gyroradius. It does not follow the magnetic field lines and is usually energetic. There exist other plasmas that comprise non-adiabatic particles. Fig. 6 illustrates a non-adiabatic plasma for the case of a betatron. The pole pieces 70 generate a magnetic field 72. As Fig. 6 illustrates, the particle orbits 74 do not follow the magnetic field lines 72. A moving charged particle radiates electromagnetic waves. The power radiated by the particle is proportional to the square of the charge. The charge of an ion is Ze, where e is the electron charge and Z is the atomic number. Therefore, for each ion there will be Z free electrons that will radiate. The total power radiated by these Z electrons is proportional to the cube of the atomic number (Z3). Fig. 8 shows the magnetic field of a FRC. The system has cylindrical symmetry with respect to its axis 78. In the FRC, there are two regions of magnetic field lines: open 80 and closed 82. The surface dividing the two regions is called the separatrix 84. The FRC forms a cylindrical null surface 86 in which the magnetic field vanishes. In the central part 88 of the FRC the magnetic field does not change appreciably in the axial direction. At the ends 90, the magnetic field does change appreciably in the axial direction. The magnetic field along the center axis 78 reverses direction in the FRC, which gives rise to the term "Reversed" in Field Reversed Configuration (FRC). In Fig. 9A, the magnetic field outside of the null surface 94 is in the direction 96. The magnetic field inside the null surface is in the direction 98. 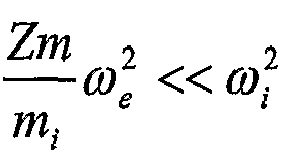 If an ion moves in the direction 100, the Lorentz force 30 acting on it points towards the null surface 94. This is easily appreciated by applying the right-hand rule. For particles moving in the direction 102, called diamagnetic, the Lorentz force always points toward the null surface 94. This phenomenon gives rise to a particle orbit called betatron orbit, to be described below. Fig. 9B shows an ion moving in the direction 104, called counterdiamagnetic. The Lorentz force in this case points away from the null surface 94. This phenomenon gives rise to a type of orbit called a drift orbit, to be described below. The diamagnetic direction for ions is counterdiamagnetic for electrons, and vice versa. Fig. 10 shows a ring or annular layer of plasma 106 rotating in the ions' diamagnetic direction 102. The ring 106 is located around the null surface 86. The magnetic field 108 created by the annular plasma layer 106, in combination with an externally applied magnetic field 110, forms a magnetic field having the topology of a FRC (The topology is shown in Fig 8). The ion beam that forms the plasma layer 106 has a temperature; therefore, the velocities of the ions form a Maxwell distribution in a frame rotating at the average angular velocity of the ion beam. Collisions between ions of different velocities lead to fusion reactions. For this reason, the plasma beam layer 106 is called a colliding beam system. Fig. 11 shows the main type of ion orbits in a colliding beam system, called a betatron orbit 112. A betatron orbit 112 can be expressed as a sine wave centered on the null circle 114. As explained above, the magnetic field on the null circle 114 vanishes. The plane of the orbit 112 is perpendicular to the axis 78 of the FRC. Ions in this orbit 112 move in their diamagnetic direction 102 from a starting point 116. An ion in a betatron orbit has two motions: an oscillation in the radial direction (perpendicular to the null circle 114), and a translation along the null circle 114. Fig. 12A is a graph of the magnetic field 118 in a FRC. The field 118 is derived using a one-dimensional equilibrium model, to be discussed below in conjunction with the theory of the invention. The horizontal axis of the graph represents the distance in centimeters from the FRC axis 78. The magnetic field is in kilogauss. As the graph depicts, the magnetic field 118 vanishes at the null circle radius 120. As shown in Fig. 12B, a particle moving near the null circle will see a gradient 126 of the magnetic field pointing away from the null surface 86. The magnetic field outside the null circle is 122, while the magnetic field inside the null circle is 124. The direction of the gradient drift is given by the cross product B × ∇B, where ∇B is the gradient of the magnetic field; thus, it can be appreciated by applying the right-hand rule that the direction of the gradient drift is in the counterdiamagnetic direction, whether the ion is outside or inside the null circle 128. Fig. 13A is a graph of the electric field 130 in a FRC. The field 130 is derived using a one-dimensional equilibrium model, to be discussed below in conjunction with the theory of the invention. The horizontal axis of the graph represents the distance in centimeters from the FRC axis 78. The electric field is in volts/cm. As the graph depicts, the electric field 130 vanishes close to the null circle radius 120. As shown if Fig. 13B, the electric field for ions is deconfining; it points away from the null surface 132,134. The magnetic field, as before, is in the directions 122,124. It can be appreciated by applying the right-hand rule that the direction of the E × B drift is in the diamagnetic direction, whether the ion is outside or inside the null surface 136. Figs. 14A and 14B show another type of common orbit in a FRC, called a drift orbit 138. Drift orbits 138 can be outside of the null surface, as shown in Fig. 14A, or inside it, as shown in Fig. 14B. Drift orbits 138 rotate in the diamagnetic direction if the E × B drift dominates or in the counterdiamagnetic direction if the gradient drift dominates. The drift orbits 138 shown in Figs. 14A and 14B rotate in the diamagnetic direction 102 from starting point 116. A drift orbit, as shown in Fig. 14C, can be thought of as a small circle rolling over a relatively bigger circle. The small circle 142 spins around its axis in the sense 144. It also rolls over the big circle 146 in the direction 102. The point 140 will trace in space a path similar to 138. Figs. 15A and 15B show the direction of the Lorentz force at the ends of a FRC. In Fig. 15A, an ion is shown moving in the diamagnetic direction 102 with a velocity 148 in a magnetic field 150. It can be appreciated by applying the right-hand rule that the Lorentz force 152 tends to push the ion back into the region of closed field lines. In this case, therefore, the Lorentz force 152 is confining for the ions. In Fig. 15B, an ion is shown moving in the counterdiamagnetic direction with a velocity 148 in a magnetic field 150. It can be appreciated by applying the right-hand rule that the Lorentz force 152 tends to push the ion into the region of open field lines. In this case, therefore, the Lorentz force 152 is deconfining for the ions. A plasma layer 106 (see Fig. 10) can be formed in a FRC by injecting energetic ion beams around the null surface 86 in the diamagnetic direction 102 of ions. (A detailed discussion of different methods of forming the FRC and plasma ring follows below.) In the circulating plasma layer 106, most of the ions have betatron orbits 112 (see Fig. 11), are energetic, and are non-adiabatic; thus, they are insensitive to short-wavelength fluctuations that cause anomalous transport. 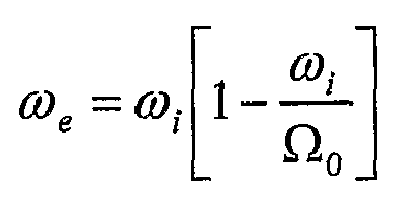 While studying a plasma layer 106 in equilibrium conditions as described above, it was discovered that the conservation of momentum imposes a relation between the angular velocity of ions ω i and the angular velocity of electrons ω e . (The derivation of this relation is given below in conjunction with the theory of the invention.) The relation is ω e = ω i ⁢ 1 - ω i Ω 0 , where Ω 0 = Ze ⁢ B 0 m i ⁢ c .
In Eq. 4, Z is the ion atomic number, m i is the ion mass, e is the electron charge, B0 is the magnitude of the applied magnetic field, and c is the speed of light. 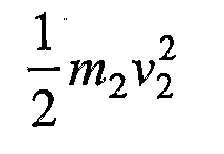 There are three free parameters in this relation: the applied magnetic field B0 , the electron angular velocity ω e , and the ion angular velocity ω i . If two of them are known, the third can be determined from Eq. 4. Because the plasma layer 106 is formed by injecting ion beams into the FRC, the angular velocity of ions ω i is determined by the injection kinetic energy of the beam W i , which is given by W i = 1 2 ⁢ m i ⁢ V i 2 = 1 2 ⁢ m i ⁢ ω i ⁢ r o 2 . Here, Vi = ω ir 0, where Vi is the injection velocity of ions, ω i is the cyclotron frequency of ions, and r 0 is the radius of the null surface 86. The kinetic energy of electrons in the beam has been ignored because the electron mass me is much smaller than the ion mass mi. The values of ω e in the table above were determined according to Eq. 4. One can appreciate that ω e > 0 means that Ω0 > ω ¡ in Eq. 4, so that electrons rotate in their counterdiamagnetic direction. Fig. 16B shows the electric potential (in volts) for the same set of values of B 0 and ω e . The horizontal axis, in Figs. 16A and 16B, represents the distance from the FRC axis 78, shown in the graph in centimeters. The analytic expressions of the electric field and the electric potential are given below in conjunction with the theory of the invention. These expressions depend strongly on ω e .
The above results can be explained on simple physical grounds. When the ions rotate in the diamagnetic direction, the ions are confined magnetically by the Lorentz force. This was shown in Fig. 9A. For electrons, rotating in the same direction as the ions, the Lorentz force is in the opposite direction, so that electrons would not be confined. The electrons leave the plasma and, as a result, a surplus of positive charge is created. This sets up an electric field that prevents other electrons from leaving the plasma. 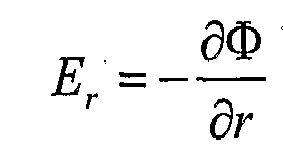 The direction and the magnitude of this electric field, in equilibrium, is determined by the conservation of momentum. The relevant mathematical details are given below in conjunction with the theory of the invention. As explained, the electrostatic field is confining for electrons if ω e > 0. As shown in Fig. 16B, the depth of the well can be increased by tuning the applied magnetic field B 0. Except for a very narrow region near the null circle, the electrons always have a small gyroradius. Therefore, electrons respond to short-wavelength fluctuations with an anomalously fast diffusion rate. This diffusion, in fact, helps maintain the potential well once the fusion reaction occurs. The fusion product ions, being of much higher energy, leave the plasma. To maintain charge quasi-neutrality, the fusion products must pull electrons out of the plasma with them, mainly taking the electrons from the surface of the plasma layer. The density of electrons at the surface of the plasma is very low, and the electrons that leave the plasma with the fusion products must be replaced; otherwise, the potential well would disappear. Fig. 17 shows a Maxwellian distribution 162 of electrons. Only very energetic electrons from the tail 160 of the Maxwell distribution can reach the surface of the plasma and leave with fusion ions. The tail 160 of the distribution 162 is thus continuously created by electron-electron collisions in the region of high density near the null surface. The energetic electrons still have a small gyroradius, so that anomalous diffusion permits them to reach the surface fast enough to accommodate the departing fusion product ions. The energetic electrons lose their energy ascending the potential well and leave with very little energy. Although the electrons can cross the magnetic field rapidly, due to anomalous transport, anomalous energy losses tend to be avoided because little energy is transported. Another consequence of the potential well is a strong cooling mechanism for electrons that is similar to evaporative cooling. For example, for water to evaporate, it must be supplied the latent heat of vaporization. This heat is supplied by the remaining liquid water and the surrounding medium, which then thermalize rapidly to a lower temperature faster than the heat transport processes can replace the energy. Similarly, for electrons, the potential well depth is equivalent to water's latent heat of vaporization. The electrons supply the energy required to ascend the potential well by the thermalization process that re-supplies the energy of the Maxwell tail so that the electrons can escape. The thermalization process thus results in a lower electron temperature, as it is much faster than any heating process. Because of the mass difference between electrons and protons, the energy transfer time from protons is about 1800 times less than the electron thermalization time. This cooling mechanism also reduces the radiation loss of electrons. This is particularly important for advanced fuels, where radiation losses are enhanced by fuel ions with atomic number Z > 1. The electrostatic field also affects ion transport. The majority of particle orbits in the plasma layer 106 are betatron orbits 112. Large-angle collisions, that is, collisions with scattering angles between 90° and 180°, can change a betatron orbit to a drift orbit. As described above, the direction of rotation of the drift orbit is determined by a competition between the E × B drift and the gradient drift. If the E × B drift dominates, the drift orbit rotates in the diamagnetic direction. If the gradient drift dominates, the drift orbit rotates in the counterdiamagnetic direction. This is shown in Figs. 18A and 18B. Fig. 18A shows a transition from a betatron orbit to a drift orbit due to a 180° collision, which occurs at the point 172. The drift orbit continues to rotate in the diamagnetic direction because the E × B drift dominates. Fig. 18B shows another 180° collision, but in this case the electrostatic field is weak and the gradient drift dominates. The drift orbit thus rotates in the counterdiamagnetic direction. The direction of rotation of the drift orbit determines whether it is confined or not. A particle moving in a drift orbit will also have a velocity parallel to the FRC axis. The time it takes the particle to go from one end of the FRC to the other, as a result of its parallel motion, is called transit time; thus, the drift orbits reach an end of the FRC in a time of the order of the transit time. As shown in connection with Fig. 15A, the Lorentz force at the ends is confining only for drift orbits rotating in the diamagnetic direction. After a transit time, therefore, ions in drift orbits rotating in the counterdiamagnetic direction are lost. This phenomenon accounts for a loss mechanism for ions, which is expected to have existed in all FRC experiments. In fact, in these experiments, the ions carried half of the current and the electrons carried the other half. In these conditions the electric field inside the plasma was negligible, and the gradient drift always dominated the E × B drift. Hence, all the drift orbits produced by large-angle collisions were lost after a transit time. These experiments reported ion diffusion rates that were faster than those predicted by classical diffusion estimates. If there is a strong electrostatic field, the E × B drift dominates the gradient drift, and the drift orbits rotate in the diamagnetic direction. This was shown above in connection with Fig. 18A. When these orbits reach the ends of the FRC, they are reflected back into the region of closed field lines by the Lorentz force; thus, they remain confined in the system. 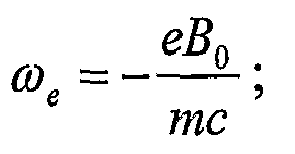 The electrostatic fields in the colliding beam system may be strong enough, so that the E × B drift dominates the gradient drift. Thus, the electrostatic field of the system would avoid ion transport by eliminating this ion loss mechanism, which is similar to a loss cone in a mirror device. Another aspect of ion diffusion can be appreciated by considering the effect of small-angle, electron-ion collisions on betatron orbits. Fig. 19A shows a betatron orbit 112; Fig. 19B shows the same orbit 112 when small-angle electron-ion collisions are considered 174; Fig. 19C shows the orbit of Fig. 19B followed for a time that is longer by a factor of ten 176; and Fig. 19D shows the orbit of Fig. 19B followed for a time longer by a factor of twenty 178. It can be seen that the topology of betatron orbits does not change due to small-angle, electron-ion collisions; however, the amplitude of their radial oscillations grows with time. In fact, the orbits shown in Figs. 19A to 19D fatten out with time, which indicates classical diffusion. For the purpose of modeling the invention, a one-dimensional equilibrium model for the colliding beam system is used, as shown in Fig. 10. The results described above were drawn from this model. 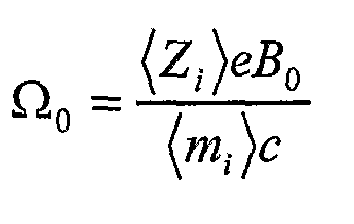 This model shows how to derive equilibrium expressions for the particle densities, the magnetic field, the electric field, and the electric potential. The equilibrium model presented herein is valid for a plasma fuel with one type of ions (e.g., in a D-D reaction) or multiple types of ions (e.g., D-T, D-He3, and p-B11). (a) All the equilibrium properties are independent of axial position z (i.e., ∂l∂z = 0). This corresponds to considering a plasma with an infinite extension in the axial direction; thus, the model is valid only for the central part 88 of a FRC. (b) The system has cylindrical symmetry. Hence, all equilibrium properties do not depend on θ (i.e., ∂/∂θ = 0). (c) The Gauss law, Eq. 8, is replaced with the quasi-neutrality condition: Σ jnjej = 0. ∑ α n j ⁢ e j = 0.
and n j r = n j 0 ⁢ exp - 1 T j ⁢ e j ⁢ Φ - ω j c ⁢ Ψ - m j 2 ⁢ ω j 2 ⁢ r 2 . … + e j T j ⁢ E → ⋅ v → - u → j - e j T j ⁢ c v → × B → ⋅ v → - u → j = 0. … + e j T j ⁢ E → ⋅ u → j = 0. 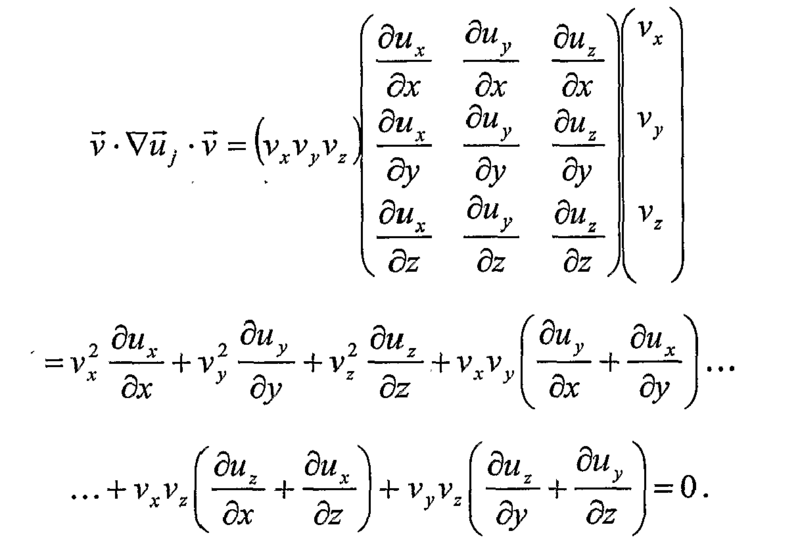 For this polynomial equation to hold for all ν, the coefficient of each power of ν must vanish. The third-order equation yields Tj (r) = constant. The second-order equation gives v → ⋅ ∇ u → j ⋅ v → = v x ⁢ v y ⁢ v z ⁢ ∂ u x ∂ x ∂ u y ∂ x ∂ u z ∂ x ∂ u x ∂ y ∂ u y ∂ y ∂ u z ∂ y ∂ u x ∂ z ∂ u y ∂ z ∂ u z ∂ z ⁢ v r v y v z = v x 2 ⁢ ∂ u x ∂ x + v y 2 ⁢ ∂ u y ∂ y + v z 2 ⁢ ∂ u z ∂ z + v x ⁢ v y ⁢ ∂ u y ∂ x + ∂ u x ∂ y … … + v x ⁢ v z ⁢ ∂ u z ∂ x + ∂ u x ∂ z + v x ⁢ v z ⁢ ∂ u z ∂ y + ∂ u y ∂ z = 0. In cylindrical coordinates, take u 0j = 0 and ω j = ω jẑ, which corresponds to injection perpendicular to a magnetic field in the ẑ direction. Then, u j ( r ) = ω jrθ̂. 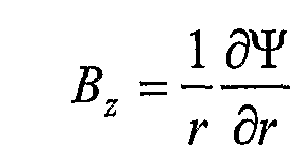 The zero order equation indicates that the electric field must be in the radial direction, i.e., E = Err̂. The first-order equation is now given by v → ⋅ ∇ ln n j - m j T j v → ⋅ ∇ u → j ⋅ u → j - e j T j ⁢ v → ⋅ E → + e j c ⁢ T j v → × B → ⋅ u → j = 0. The second term in Eq. 18 can be rewritten with ∇ u → j ⋅ u → j = ∂ u r ∂ r ∂ u θ ∂ r ∂ u z ∂ r 1 r ⁢ ∂ u r ∂ θ 1 r ⁢ ∂ u θ ∂ θ 1 r ⁢ ∂ u z ∂ θ ∂ u r ∂ z ∂ u θ ∂ z ∂ u z ∂ z ⁢ u r u θ u z = 0 ω j 0 0 0 0 0 0 0 ⁢ 0 ω j ⁢ r 0 = ω j 2 ⁢ r ⁢ r ^ . Using Eqs. 19 and 20, the first-order Eq. 18 becomes ∂ ∂ r ln n j - m j T j ⁢ ω j 2 ⁢ r - e j T j ⁢ E r + e j ⁢ ω j c ⁢ T j ⁢ ∂ ∂ r r ⁢ A θ r = 0.
where Er = -dΦ/dr and n j(0) is given by n j 0 = n j ⁢ 0 exp - m j ⁢ ω j 2 ⁢ r 0 2 2 ⁢ T j + e j ⁢ Φ r 0 T j + e j ⁢ ω j ⁢ r 0 ⁢ A θ r 0 c ⁢ T j . Here, n j0 is the peak density at r 0. ∑ j n j ⁢ e j ≅ 0.
and eliminating Er from the ion equation yields 1 r ⁢ ⅆ log ⁢ n i ⅆ r = Z i ⁢ e c ⁢ ω i - ω e T i ⁢ B z - Z z ⁢ T e T i ⁢ 1 r ⁢ ⅆ log ⁢ n e ⅆ r + m i ⁢ ω i 2 T i + m ⁢ Z i ⁢ ω e 2 T i .
with Te = T¡ = constant, and ω i , ω e , constants, obtaining 1 r ⁢ ⅆ ⅆ r ⁢ ⅆ log ⁢ n i ⅆ r = - 4 ⁢ π ⁢ n e ⁢ Z i ⁢ e 2 T i ⁢ ω i - ω e 2 c 2 - Z i ⁢ T e T i ⁢ 1 r ⁢ ⅆ ⅆ r ⁢ 1 r ⁢ ⅆ log ⁢ n e ⅆ r .
The new variable ξ is introduced: ξ = r 2 2 ⁢ r 0 2 ⇒ 1 r ⁢ ⅆ ⅆ r ⁢ 1 r ⁢ ⅆ ⅆ r = 1 r 0 4 ⁢ ⅆ 2 ⅆ 2 ⁢ ξ .
Eq. 29 can be expressed in terms of the new variable ξ: ⅆ 2 ⁢ log ⁢ n i ⅆ 2 ⁢ ξ = - 4 ⁢ π ⁢ n e ⁢ Z i ⁢ e 2 ⁢ r 0 4 T i ⁢ ω i - ω e 2 c 2 - Z i ⁢ T e T i ⁢ ⅆ 2 ⁢ log ⁢ n e ⅆ 2 ⁢ ξ .
yields ⅆ 2 ⁢ log ⁢ n i ⅆ 2 ⁢ ξ = - r 0 4 T i + Z i ⁢ T e 4 ⁢ π ⁢ Z i 2 ⁢ e 2 ⁢ c 2 ω i - ω e 2 ⁢ n i = - r 0 4 T e + T i Z i 4 ⁢ π ⁢ n e ⁢ 0 ⁢ e 2 ⁢ c 2 ω i - ω e 2 ⁢ n i n i ⁢ 0 = - 8 ⁢ r 0 Δ ⁢ r 2 ⁢ n i n i ⁢ 0 .
where the meaning of Δr will become apparent soon. If Ni = n i/ni0 , where ni0 is the peak density at r = r0 , Eq. 32 becomes ⅆ 2 ⁢ log ⁢ N i ⅆ 2 ⁢ ξ = - 8 ⁢ r 0 Δ ⁢ r 2 ⁢ N i .
where χ0 = χ(r 0) because of the physical requirement that Ni (r 0) = 1. Finally, the ion density is given by n i = n i ⁢ 0 cosh 2 2 r 0 Δ ⁢ r ⁢ ξ - 1 2 = n i ⁢ 0 cosh 2 ⁢ r 2 - r 0 2 r 0 ⁢ Δ ⁢ r .
The significance of r 0 is that it is the location of peak density. Note that n i 0 = n i 2 ⁢ r 0 . With the ion density known, Bz can be calculated using Eq. 11, and Er can be calculated using Eq. 27. Thus, Δr represents an "effective thickness." In other words, for the purpose of line density, the plasma can be thought of as concentrated at the null circle in a ring of thickness Δr with constant density ne0 . 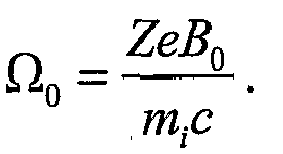 The magnetic field is B z r = B z 0 - 4 ⁢ π c ⁢ ∫ rʹ = 0 rʹ = r ⁢ drʹ ⁢ n e ⁢ erʹ ⁢ ω i - ω e .
The current due to the ion and electron beams is I θ = ∫ 0 2 ⁢ r 0 ⁢ j θ ⁢ dr = N e ⁢ e ⁢ ω i - ω e 2 ⁢ π j θ = n 0 ⁢ er ⁢ ω i - ω e .
Using Eq. 39, the magnetic field can be written as B z r = B z 0 - 2 ⁢ π c ⁢ I θ - 2 ⁢ π c ⁢ I θ tanh r 2 - r 0 2 r 0 ⁢ Δ ⁢ r = - B 0 - 2 ⁢ π c ⁢ I θ tanh r 2 - r 0 2 r 0 ⁢ Δ ⁢ r .
and B - z 2 ⁢ r 0 = - B 0 - 2 ⁢ π c ⁢ I θ . If the plasma current I θ vanishes, the magnetic field is constant, as expected. These relations are illustrated in Figs. 20A through 20C. Fig. 20A shows the external magnetic field B 0 180. Fig. 20B shows the magnetic field due to the ring of current 182, the magnetic field having a magnitude of (2π/c)I θ. Fig. 20C shows field reversal 184 due to the overlapping of the two magnetic fields 180,182.
using the following definition for β: 2 ⁢ π c ⁢ I θ B 0 = N e ⁢ e ⁢ ω i - ω e c ⁢ B 0 = 2 ⁢ π c ⁢ n e ⁢ 0 ⁢ r 0 ⁢ Δ ⁢ re ⁢ ω i - ω e B 0 … … = 2 ⁢ π c ⁢ 2 ⁢ 2 ⁢ T e + T i / Z i 4 ⁢ π ⁢ n e ⁢ 0 ⁢ e 2 1 2 ⁢ c ⁢ n e ⁢ 0 ω i - ω e ⁢ e ⁢ ω i - ω e B 0 … … = 8 ⁢ π ⁢ n e ⁢ 0 ⁢ T e + n i ⁢ 0 ⁢ T i B 0 2 1 2 ≡ β .
which yields Φ = ω e e ⁢ Ψ + T e e ⁢ ln ⁢ n e r n e 0 - m e ⁢ r 2 ⁢ ω e 2 2 . … = - B 0 ⁢ r 2 2 + B 0 ⁢ β ⁢ r 0 ⁢ Δr 4 ⁢ log ⁢ n e r n e 0 . Substituting Eq. 46 into Eq. 45 yields Φ = ω e c ⁢ B 0 ⁢ β ⁢ r 0 ⁢ Δ ⁢ r 4 ⁢ log ⁢ n e r n e 0 + T e e ⁢ ln ⁢ n e r n e 0 - ω e c ⁢ B 0 ⁢ r 2 2 - m e ⁢ r 2 ⁢ ω e 2 2 . Using the definition of β, ω e c ⁢ B 0 ⁢ β ⁢ r 0 ⁢ Δ ⁢ r = ω e c ⁢ 8 ⁢ π ⁢ n e ⁢ 0 ⁢ T e + n i ⁢ 0 ⁢ T i ⁢ 2 ⁢ T e + T i / 2 1 2 4 ⁢ π ⁢ n e ⁢ 0 ⁢ e 2 ⁢ c ω i - ω e … … = 4 ⁢ ω e ω i - ω e ⁢ n 0 ⁢ e ⁢ T e + n i ⁢ 0 ⁢ T i n e ⁢ 0 ⁢ e .
Φ r = ω e ω i - ω e ⁢ n 0 ⁢ e ⁢ T e + n i ⁢ 0 ⁢ T i n e ⁢ 0 ⁢ e + T e e ⁢ ln ⁢ n e r n e 0 - ω e c ⁢ B 0 ⁢ r 2 2 - m e ⁢ r 2 ⁢ ω e 2 c .
An expression for the electron angular velocity ω e can also be derived from Eqs. 24 through 26. It is assumed that ions have an average energy ½m¡ (rω i )2, which is determined by the method of formation of the FRC. Therefore, ω i is determined by the FRC formation method, and ω e can be determined by Eq. 24 by combining the equations for electrons and ions to eliminate the electric field: - n e ⁢ mr ⁢ ω e 2 + n i ⁢ m i ⁢ r ⁢ ω i 2 = n e ⁢ er c ⁢ ω i - ω e ⁢ B z - T e ⁢ ⅆ n e ⅆ r - T i ⁢ ⅆ n i ⅆ r .
Eq. 25 can then be used to eliminate (ω i - ω e ) to obtain n e ⁢ mr ⁢ ω e 2 + n i ⁢ m i ⁢ r ⁢ ω i 2 = ⅆ ⅆ r ⁢ B z 2 8 ⁢ π + ∑ j n j ⁢ T j .
Eq. 52 can be integrated from r = 0 to r B = 2 ⁢ r 0 . Assuming r 0/Δr >> 1, the density is very small at both boundaries and B z = - B 0 1 ± β . Carrying out the integration shows n e ⁢ 0 ⁢ m ⁢ ω e 2 + n i ⁢ 0 ⁢ m i ⁢ ω i 2 ⁢ r 0 ⁢ Δ ⁢ r = B 0 2 ⁢ π ⁢ 8 ⁢ π ⁢ n e ⁢ 0 ⁢ T e + n i ⁢ 0 ⁢ T i 1 2 .
where Ω 0 = ZeB 0 m i ⁢ c .
and ω e ≅ ω i ⁢ 1 - ω i Ω 0 . In the first case, the current is carried entirely by electrons moving in their diamagnetic direction (ω e < 0). The electrons are confined magnetically, and the ions are confined electrostatically by E r = T i Zen i ⁢ ⅆ n i ⅆ r ≤ 0 for r ≥ r 0 ≥ 0 for r ≤ r 0 . In the second case, the current is carried entirely by ions moving in their diamagnetic direction (ω i > 0). If ω ¡ is specified from the ion energy ½mi (rω i )2, determined in the formation process, then ω e = 0 and Ω0 = ω i identifies the value of B 0, the externally applied magnetic field. The ions are magnetically confined, and electrons are electrostatically confined by E r = - T e en e ⁢ ⅆ n e ⅆ r ≥ 0 for r ≥ r 0 ≤ 0 for r ≤ r 0 . N e = ∫ r = 0 r B ⁢ 2 ⁢ πrdr ⁢ n e = 2 ⁢ π ⁢ r 0 ⁢ Δ ⁢ r ⁢ n e ⁢ 0 .
and r 0Δr ∝ (ω ¡ -ω e )-1 according to Eq. 33. The electron angular velocity ω e can be increased by tuning the applied magnetic field B 0. This does not change either I θ or the maximum magnetic field produced by the plasma current, which is B 0 ⁢ β = 2 ⁢ π / c ⁢ I θ . However, it does change Δr and, significantly, the potential Φ. The maximum value of Φ is increased, as is the electric field that confines the electrons. is the same as for ω e = 0. This analysis can be carried out to include plasmas comprising multiple types of ions. Fusion fuels of interest involve two different kinds of ions, e.g., D-T, D-He3, and H-B11. The equilibrium equations (Eqs. 24 through 26) apply, except that j = e, 1, 2 denotes electrons and two types of ions where Z 1 = 1 in each case and Z 2 = Z = 1, 2, 5 for the above fuels. The equations for electrons and two types of ions cannot be solved exactly in terms of elementary functions. Accordingly, an iterative method has been developed that begins with an approximate solution. - n 2 ⁢ m 2 ⁢ r ⁢ ω 2 2 = n 2 ⁢ e ⁢ E r + r ⁢ ω 2 c ⁢ B z - T 2 ⁢ ⅆ n 2 ⅆ r .
where n i = n 1 + n 2; ω i =ω1 = ω2; T¡ = T 1 = T 2; ni 〈mi 〉 =n 1 m 1 + n 2 m 2; and ni 〈Z〉 = n 1 + n 2 Z. The approximation is to assume that 〈mi 〉 and 〈Z〉 are constants obtained by replacing n 1(r) and n 2(r) by n 10 and n 20, the maximum values of the respective functions. The solution of this problem is now the same as the previous solution for the single ion type, except that 〈Z〉 replaces Z and 〈mi 〉 replaces mi. The values of n 1 and n 2 can be obtained from n 1 + n2 = ni and n 1 + Zn2 = ne = 〈Z〉ni. It can be appreciated that n 1 and n2 have the same functional form. where N 1 = n 1 r n 10 , N 2 = n 2 r n 20 , ξ = r 2 2 ⁢ r 0 2 , Ω 1 = e ⁢ B 0 m 1 ⁢ c , and Ω 2 = Ze ⁢ B 0 m 2 ⁢ c .
The first iteration can be obtained by substituting the approximate values of Bz (ξ) and Ne (ξ) in the right hand sides of Eqs. 62 and 63 and integrating to obtain the corrected values of n 1(r), n 2(r), and Bz (r). Fig. 25 illustrates a preferred embodiment of a containment system 300 according to the present invention. The containment system 300 comprises a chamber wall 305 that defines therein a confining chamber 310. Preferably, the chamber 310 is cylindrical in shape, with principle axis 315 along the center of the chamber 310. For application of this containment system 300 to a fusion reactor, it is necessary to create a vacuum or near vacuum inside the chamber 310. Concentric with the principle axis 315 is a betatron flux coil 320, located within the chamber 310. The betatron flux coil 320 comprises an electrical current carrying medium adapted to direct current around a long coil, as shown, which preferably comprises parallel winding multiple separate coils, and most perferably parallel windings of about four separate coils, to form a long coil. Persons skilled in the art will appreciate that current through the betatron coil 320 will result in a magnetic field inside the betatron coil 320, substantially in the direction of the principle axis 315. The outer coil 325 and mirror coils 330 are shown in Fig. 25 implemented outside the chamber wall 305; however, they may be inside the chamber 310. In cases where the chamber wall 305 is constructed of a conductive material such as metal, it may be advantageous to place the coils 325, 330 inside the chamber wall 305 because the time that it takes for the magnetic field to diffuse through the wall 305 may be relatively large and thus cause the system 300 to react sluggishly. Similarly, the chamber 310 may be of the shape of a hollow cylinder, the chamber wall 305 forming a long, annular ring. In such a case, the betatron flux coil 320 could be implemented outside of the chamber wall 305 in the center of that annular ring. Preferably, the inner wall forming the center of the annular ring may comprise a non-conducting material such as glass. As will become apparent, the chamber 310 must be of sufficient size and shape to allow the circulating plasma beam or layer 335 to rotate around the principle axis 315 at a given radius. As explained above, a circulating plasma beam 335, comprising charged particles, may be contained within the chamber 310 by the Lorentz force caused by the magnetic field due to the outer coil 325. As such, the ions in the plasma beam 335 are magnetically contained in large betatron orbits about the flux lines from the outer coil 325, which are parallel to the principle axis 315. One or more beam injection ports 340 are also provided for adding plasma ions to the circulating plasma beam 335 in the chamber 310. In a preferred embodiment, the injector ports 340 are adapted to inject an ion beam at about the same radial position from the principle axis 315 where the circulating plasma beam 335 is contained (i.e., around the null surface). Further, the injector ports 340 are adapted to inject ion beams 350 (See Fig. 28) tangent to and in the direction of the betatron orbit of the contained plasma beam 335. Conventional procedures used to form a FRC primarily employ the theta pinch-field reversal procedure. In this conventional method, a bias magnetic field is applied by external coils surrounding a neutral gas back-filled chamber. Once this has occurred, the gas is ionized and the bias magnetic field is frozen in the plasma. Next, the current in the external coils is rapidly reversed and the oppositely oriented magnetic field lines connect with the previously frozen lines to form the closed topology of the FRC (see Fig. 8). This formation process is largely empirical and there exists almost no means of controlling the formation of the FRC. The method has poor reproducibility and no tuning capability as a result. In contrast, the FRC formation methods of the present invention allow for ample control and provide a much more transparent and reproducible process. In fact, the FRC formed by the methods of the present invention can be tuned and its shape as well as other properties can be directly-influenced by manipulation of the magnetic field applied by the outer field coils 325. Formation of the FRC by methods of the present inventions also results in the formation of the electric field and potential well in the manner described in detail above. Moreover, the present methods can be easily extended to accelerate the FRC to reactor level parameters and high-energy fuel currents, and advantageously enables the classical confinement of the ions. Furthermore, the technique can be employed in a compact device and is very robust as well as easy to implement - all highly desirable characteristics for reactor systems. In the present methods, FRC formation relates to the circulating plasma beam 335. It can be appreciated that the circulating plasma beam 335, because it is a current, creates a poloidal magnetic field, as would an electrical current in a circular wire. Inside the circulating plasma beam 335, the magnetic self-field that it induces opposes the externally applied magnetic field due to the outer coil 325. Outside the plasma beam 335, the magnetic self-field is in the same direction as the applied magnetic field. When the plasma ion current is sufficiently large, the self-field overcomes the applied field, and the magnetic field reverses inside the circulating plasma beam 335, thereby forming the FRC topology as shown in Figs. 8 and 10.
where α i = e 2/ mic 2 = 1.57 × 10-16 cm and the ion beam energy is 1 2 ⁢ m i ⁢ V 0 2 . In the one-dimensional model, the magnetic field from the plasma current is Bp = (2π/c)ip , where ip is current per unit of length. The field reversal requirement is ip > eV 0 lπr 0α i = 0.225 kA/cm, where B 0 = 69.3 G and 1 2 ⁢ m i ⁢ V 0 2 = 100 eV . For a model with periodic rings and Bz is averaged over the axial coordinate 〈Bz 〉 = (2π/c)(Ip /s) (s is the ring spacing), if s = r 0, this model would have the same average magnetic field as the one dimensional model with ip = Ip /s. A preferred method of forming a FRC within the confinement system 300 described above is herein termed the combined beam/betatron technique. This approach combines low energy beams of plasma ions with betatron acceleration using the betatron flux coil 320. The first step in this method is to inject a substantially annular cloud layer of background plasma in the chamber 310 using the background plasma sources 345. Outer coil 325 produces a magnetic field inside the chamber 310, which magnetizes the background plasma. At short intervals, low energy ion beams are injected into the chamber 310 through the injector ports 340 substantially transverse to the externally applied magnetic field within the chamber 310. As explained above, the ion beams are trapped within the chamber 310 in large betatron orbits by this magnetic field. The ion beams may be generated by an ion accelerator, such as an accelerator comprising an ion diode and a Marx generator. (see R.B. Miller, An Introduction to the Physics of Intense Charged Particle Beams, (1982)). As one of skill in the art can appreciate, the externally applied magnetic field will exert a Lorentz force on the injected ion beam as soon as it enters the chamber 310; however, it is desired that the beam not deflect, and thus not enter a betatron orbit, until the ion beam reaches the circulating plasma beam 335. To solve this problem, the ion beams are neutralized with electrons and directed through a substantially constant unidirectional magnetic field before entering the chamber 310. As illustrated in Fig. 26, when the ion beam 350 is directed through an appropriate magnetic field, the positively charged ions and negatively charged electrons separate. The ion beam 350 thus acquires an electric self-polarization due to the magnetic field. This magnetic field may be produced by, e.g., a permanent magnet or by an electromagnet along the path of the ion beam. When subsequently introduced into the confinement chamber 310, the resultant electric field balances the magnetic force on the beam particles, allowing the ion beam to drift undeflected. Fig. 27 shows a head-on view of the ion beam 350 as it contacts the plasma 335. As depicted, electrons from the plasma 335 travel along magnetic field lines into or out of the beam 350, which thereby drains the beam's electric polarization. When the beam is no longer electrically polarized, the beam joins the circulating plasma beam 335 in a betatron orbit around the principle axis 315, as shown in Fig. 25. When the plasma beam 335 travels in its betatron orbit, the moving ions comprise a current, which in turn gives rise to a poloidal magnetic self-field. To produce the FRC topology within the chamber 310, it is necessary to increase the velocity of the plasma beam 335, thus increasing the magnitude of the magnetic self-field that the plasma beam 335 causes. When the magnetic self-field is large enough, the direction of the magnetic field at radial distances from the axis 315 within the plasma beam 335 reverses, giving rise to a FRC. (See Figs. 8 and 10). It can be appreciated that, to maintain the radial distance of the circulating plasma beam 335 in the betatron orbit, it is necessary to increase the applied magnetic field from the outer coil 325 as the plasma beam 335 increases in velocity. A control system is thus provided for maintaining an appropriate applied magnetic field, dictated by the current through the outer coil 325. Alternatively, a second outer coil may be used to provide the additional applied magnetic field that is required to maintain the radius of the plasma beam's orbit as it is accelerated. To increase the velocity of the circulating plasma beam 335 in its orbit, the betatron flux coil 320 is provided. Referring to Fig. 28, it can be appreciated that increasing a current through the betatron flux coil 320, by Ampere's Law, induces an azimuthal electric field, E, inside the chamber 310. The positively charged ions in the plasma beam 335 are accelerated by this induced electric field, leading to field reversal as described above. When ion beams are added to the circulating plasma beam 335, as described above, the plasma beam 335 depolarizes the ion beams. where 〈 B z 〉 = - B F ⁢ r a r 0 2 - B c ⁢ 1 - r a r 0 2 .
and 〈Bz 〉 = -2Bc + B 0, assuming that the initial values of BF and Bc are both B 0. Eq. 67 can be expressed as ∂ V ∂ t = - e 2 ⁢ m i ⁢ c ⁢ r 0 ⁢ ∂ 〈 B z 〉 ∂ t .
assuming B 0 = 69.3 G, WlW 0 = 1000, and r 0/ra = 2. This calculation applies to a collection of ions, provided that they are all located at nearly the same radius r 0 and the number of ions is insufficient to alter the magnetic fields. and r0 = 20 cm, so it follows that rb = 26.5 cm. Ip is the plasma current per unit length. and B ‾ z = - B F ⁢ r a r 0 2 - B c ⁢ 1 - r a r 0 2 .
and 〈 B z 〉 = B ‾ z + c π ⁢ r 0 2 ⁢ L p ⁢ I p .
and Eq. 67 becomes: ∂ V i ∂ t = e m i ⁢ r 0 c ⁢ ∂ B c ∂ t = - e 2 ⁢ m i ⁢ c ⁢ r 0 ⁢ ∂ B ‾ z ∂ t = - e m i ⁢ L p 2 ⁢ π ⁢ r 0 ⁢ ∂ I p ∂ t .
After integrating, Δ ⁢ B ‾ z = - 2 ⁢ B 0 ⁢ 1 + r b 2 - r a 2 r 0 2 ⁢ W W 0 - 1 .
and B F = B F ⁢ 0 - r 0 r a 2 - Δ ⁢ B ‾ z - r 0 2 - r a 2 r a 2 ⁢ Δ ⁢ B c = 25 kG . If the final energy is 200 keV, Bc = 3.13 kG and BF = 34.5 kG. The magnetic energy in the flux coil would be B F 2 8 ⁢ π ⁢ π ⁢ r F 2 ⁢ l = 172 kJ . The plasma current is initially 0.225 kA/cm corresponding to a magnetic field of 140 G, which increases to 10 kA/cm and a magnetic field of 6.26 kG. In the above calculations, the drag due to Coulomb collisions has been neglected. In the injection/trapping phase, it was equivalent to 0.38 volts/cm. It decreases as the electron temperature increases during acceleration. The inductive drag, which is included, is 4.7 volts/cm, assuming acceleration to 200 keV in 100 µs. is the ring inductance. Also, r0 = 20 cm and a = 4 cm. To compensate the drag, the betatron flux coil 320 must provide an electric field of 1.9 volts/cm (0.38 volts/cm for the Coulomb drag and 1.56 volts/cm for the inductive drag). The magnetic field in the betatron flux coil 320 must increase by 78 Gauss/µs to accomplish this, in which case Vb will be constant. The rise time of the current to 4.5 kA is 18 µs, so that the magnetic field BF will increase by 1.4 kG. The magnetic field energy required in the betatron flux coil 320 is B F 2 8 ⁢ π × πr F 2 ⁢ l = 394 Joules l = 115 ⁢ cm . Another preferred method of forming a FRC within the confinement system 300 is herein termed the betatron formation technique. This technique is based on driving the betatron induced current directly to accelerate a circulating plasma beam 335 using the betatron flux coil 320. A preferred embodiment of this technique uses the confinement system 300 depicted in Fig. 25, except that the injection of low energy ion beams is not necessary. At this point the betatron flux coil 320 is energized. The rapidly rising current in the coil 320 causes a fast changing axial flux in the coil's interior. By virtue of inductive effects this rapid increase in axial flux causes the generation of an azimuthal electric field E (see Fig. 29), which permeates the space around the flux coil. By Maxwell's equations, this electric field is directly proportional to the change in strength of the magnetic flux inside the coil, i.e. : a faster betatron coil current ramp-up will lead to a stronger electric field. The inductively created electric field couples to the charged particles in the plasma and causes a ponderomotive force, which accelerates the particles in the annular plasma layer. Electrons, by virtue of their smaller mass, are the first species to experience acceleration. The initial current formed by this process is, thus, primarily due to electrons. However, sufficient acceleration time (around hundreds of micro-seconds) will eventually also lead to ion current. Referring to Fig. 29, this electric field accelerates the electrons and ions in opposite directions. Once both species reach their terminal velocities, current is carried about equally by ions and electrons. As noted above, the current carried by the rotating plasma gives rise to a self magnetic field. The creation of the actual FRC topology sets in when the self magnetic field created by the current in the plasma layer becomes comparable to the applied magnetic field from the external field coils 325, 330. At this point magnetic reconnection occurs and the open field lines of the initial externally produced magnetic field begin to close and form the FRC flux surfaces (see Figs. 8 and 10). Experiments - Beam Trapping and FRC Formation Experiment 1: Propagating and trapping of a neutralized beam in a magnetic containment vessel to create an FRC. Plasma beam orbit radius of 20 cm. Mean kinetic energy of streaming beam plasma was measured to be about 100 eV, with a density of about 1013 cm-3, kinetic temperature on the order of 10 eV and a pulse-length of about 20 µs. Mean magnetic field produced in the trapping volume was around 100 Gauss, with a ramp-up period of 150 µs. Source: Outer coils and betatron coils. Neutralizing background plasma (substantially Hydrogen gas) was characterized by a mean density of about 1013 cm-3, kinetic temperature of less than 10 eV. The beam was generated in a deflagration type plasma gun. The plasma beam source was neutral Hydrogen gas, which was injected through the back of the gun through a special puff valve. Different geometrical designs of the electrode assembly were utilized in an overall cylindrical arrangement. The charging voltage was typically adjusted between 5 and 7.5 kV. Peak breakdown currents in the guns exceeded 250,000 A. During part of the experimental runs, additional pre-ionized plasma was provided by means of an array of small peripheral cable guns feeding into the central gun electrode assembly before, during or after neutral gas injection. This provided for extended pulse lengths of above 25 µs. The emerging low energy neutralized beam was cooled by means of streaming through a drift tube of non-conducting material before entering the main vacuum chamber. The beam plasma was also pre-magnetized while streaming through this tube by means of permanent magnets. The beam self-polarized while traveling through the drift tube and entering the chamber, causing the generation of a beam-internal electric field that offset the magnetic field forces on the beam. By virtue of this mechanism it was possible to propagate beams as characterized above through a region of magnetic field without deflection. Upon further penetration into the chamber, the beam reached the desired orbit location and encountered a layer of background plasma provided by an array of cable guns and other surface flashover sources. The proximity of sufficient electron density caused the beam to loose its self-polarization field and follow single particle like orbits, essentially trapping the beam. Faraday cup and B-dot probe measurements confirmed the trapping of the beam and its orbit. The beam was observed to have performed the desired circular orbit upon trapping. The beam plasma was followed along its orbit for close to¾ of a turn. The measurements indicated that continued frictional and inductive losses caused the beam particles to loose sufficient energy for them to curl inward from the desired orbit and hit the betatron coil surface at around the ¾ turn mark. To prevent this, the losses could be compensated by supplying additional energy to the orbiting beam by inductively driving the particles by means of the betatron coil. Experiment 2: FRC formation utilizing the combined beam/betatron formation technique. FRC formation was successfully demonstrated utilizing the combined beam/betatron formation technique. The combined beam/betatron formation technique was performed experimentally in a chamber 1 m in diameter and 1.5 m in length using an externally applied magnetic field of up to 500 G, a magnetic field from the betatron flux coil 320 of up to 5 kG, and a vacuum of 1.2 × 10-5 torr. In the experiment, the background plasma had a density of 1013 cm-3 and the ion beam was a neutralized Hydrogen beam having a density of 1.2 × 1013 cm-3, a velocity of 2 × 107 cm/s, and a pulse length of around 20 µs (at half height). Field reversal was observed. Experiment 3: FRC formation utilizing the betatron formation technique. Mean external magnetic field produced in the vacuum chamber was up to 100 Gauss, with a ramp-up period of 150 µs and a mirror ratio of 2 to 1. (Source: Outer coils and betatron coils). An example of typical data is shown by the traces of B-dot probe signals in Fig. 30. The data curve A represents the absolute strength of the axial component of the magnetic field at the axial mid-plane (75 cm from either end plate) of the experimental chamber and at a radial position of 15 cm. The data curve B represents the absolute strength of the axial component of the magnetic field at the chamber axial mid-plane and at a radial position of 30 cm. The curve A data set, therefore, indicates magnetic field strength inside of the fuel plasma layer (between betatron coil and plasma) while the curve B data set depicts the magnetic field strength outside of the fuel plasma layer. The data clearly indicates that the inner magnetic field reverses orientation (is negative) between about 23 and 47 µs, while the outer field stays positive, i.e., does not reverse orientation. The time of reversal is limited by the ramp-up of current in the betatron coil. Once peak current is reached in the betatron coil, the induced current in the fuel plasma layer starts to decrease and the FRC rapidly decays. Up to now the lifetime of the FRC is limited by the energy that can be stored in the experiment. As with the injection and trapping experiments, the system can be upgraded to provide longer FRC lifetime and acceleration to reactor relevant parameters. Experiment 4: FRC formation utilizing the betatron formation technique. An attempt to form an FRC utilizing the betatron formation technique has been performed experimentally in a chamber 1 m in diameter and 1.5 m in length using an externally applied magnetic field of up to 500 G, a magnetic field from the betatron flux coil 320 of up to 5 kG, and a vacuum of 5 × 10-6 torr. In the experiment, the background plasma comprised substantially Hydrogen with of a density of 1013 cm-3 and a lifetime of about 40 µs. Field reversal was observed. Significantly, these two techniques for forming a FRC inside of a containment system 300 described above, or the like, can result in plasmas having properties suitable for causing nuclear fusion therein. More particularly, the FRC formed by these methods can be accelerated to any desired level of rotational energy and magnetic field strength. This is crucial for fusion applications and classical confinement of high-energy fuel beams. In the confinement system 300, therefore, it becomes possible to trap and confine high-energy plasma beams for sufficient periods of time to cause a fusion reaction therewith. To accommodate fusion, the FRC formed by these methods is preferably accelerated to appropriate levels of rotational energy and magnetic field strength by betatron acceleration. Fusion, however, tends to require a particular set of physical conditions for any reaction to take place. In addition, to achieve efficient bum-up of the fuel and obtain a positive energy balance, the fuel has to be kept in this state substantially unchanged for prolonged periods of time. This is important, as high kinetic temperature and/or energy characterize a fusion relevant state. Creation of this state, therefore, requires sizeable input of energy, which can only be recovered if most of the fuel undergoes fusion. As a consequence, the confinement time of the fuel has to be longer than its burn time. This leads to a positive energy balance and consequently net energy output. Classical Confinement time: greater than the fuel burn time and preferably in a range of about 10 to 100 seconds. To accommodate the fusion state illustrated above, the FRC is preferably accelerated to a level of coherent rotational energy preferably in a range of about 100 keV to 3.3 MeV, and more preferably in a range of about 300 keV to 3.3 MeV, and a level of magnetic field strength preferably in a range of about 45 to 120 kG, and more preferably in a range of about 90 to 115 kG. At these levels, high energy ion beams can be injected into the FRC and trapped to form a plasma beam layer wherein the plasma beam ions are magnetically confined and the plasma beam electrons are electrostatically confined. The ion temperature is preferably kept at a level that provides for efficient bum-up since the fusion cross-section is a function of ion temperature. High direct energy of the fuel ion beams is essential to provide classical transport as discussed in this application. It also minimizes the effects of instabilities on the fuel plasma. The magnetic field is consistent with the beam rotation energy. It is partially created by the plasma beam (self-field) and in turn provides the support and force to keep the plasma beam on the desired orbit. The fusion products are born predominantly near the null surface from where they emerge by diffusion towards the separatrix 84 (see Fig. 8). This is due to collisions with electrons (as collisions with ions do not change the center of mass and therefore do not cause them to change field lines). Because of their high kinetic energy (product ions have much higher energy than the fuel ions), the fusion products can readily cross the separatrix 84. Once they are beyond the separatrix 84, they can leave along the open field lines 80 provided that they experience scattering from ion-ion collisions. Although this collisional process does not lead to diffusion, it can change the direction of the ion velocity vector such that it points parallel to the magnetic field. These open field lines 80 connect the FRC topology of the core with the uniform applied field provided outside the FRC topology. Product ions emerge on different field lines, which they follow with a distribution of energies; advantageously in the form of a rotating annular beam. In the strong magnetic fields found outside the separatrix 84 (typically around 100 kG), the product ions have an associated distribution of gyro-radii that varies from a minimum value of about 1 cm to a maximum of around 3 cm for the most energetic product ions. Initially the product ions have longitudinal as well as rotational energy characterized by ½ M(vpar)2 and ½ M(vperp)2. vperp is the azimuthal velocity associated with rotation around a field line as the orbital center. Since the field lines spread out after leaving the vicinity of the FRC topology, the rotational energy tends to decrease while the total energy remains constant. This is a consequence of the adiabatic invariance of the magnetic moment of the product ions. It is well known in the art that charged particles orbiting in a magnetic field have a magnetic moment associated with their motion. 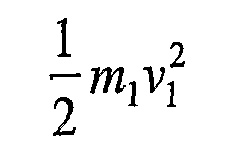 In the case of particles moving along a slow changing magnetic field, there also exists an adiabatic invariant of the motion described by ½ M(vperp)2/B. The product ions orbiting around their respective field lines have a magnetic moment and such an adiabatic invariant associated with their motion. Since B decreases by a factor of about 10 (indicated by the spreading of the field lines), it follows that vperp will likewise decrease by about 3.2. Thus, by the time the product ions arrive at the uniform field region their rotational energy would be less than 5% of their total energy; in other words almost all the energy is in the longitudinal component. Further aspects and advantages of the invention will be appreciated from the following numbered clauses. 1. A plasma containment device comprising a chamber, a magnetic field generator to apply a magnetic field within the chamber substantially along a principle axis of the chamber, a current coil to induce an azimuthal electric field within the chamber, and a plasma source to inject a plasma containing electrons and ions into the chamber. 2. The containment device of statement 1 wherein the magnetic field generator comprises a plurality of field coils extending about the chamber. 3. The containment device of statement 2 wherein the magnetic field generator comprises a plurality of mirror coils. 4. The containment device of statement 1 wherein the magnetic field generator is positioned external to the chamber. 5. The containment device of statement 1 wherein the magnetic field generator is positioned within the chamber. 6. The containment device of statement 1 wherein the magnetic field generator is tunable to produce and control an electrostatic field within the chamber. 7. The containment device of statement 6 further comprising a control system coupled to the magnetic field generator. 8. The containment device of statement 1 wherein the current coil is a betatron flux coil. 9. The containment device of statement 1 wherein the current coil includes parallel windings of a plurality of separate coils. 10. The containment device of statement 1 further comprising ion beam injectors to inject ion beams into the chamber. 11. The containment device of statement 11 wherein the ion beam injectors are adapted to inject electric charge neutralized ion beams into the chamber. 12. The containment device of statement 1 wherein the chamber is generally cylindrical. 13. The containment device of statement 1 wherein the chamber is generally annular. 14. An apparatus for containing plasma comprising a chamber, a magnetic and electrostatic confinement system operably associated with the chamber, and a plasma source operably associated with the chamber. 15. The apparatus of statement 14 wherein the confinement system comprises a magnetic field generator to generate a magnetic field within the chamber. 16. The apparatus of statement 15 wherein the magnetic field has a field reverse topology. 17. The apparatus of statement 16 wherein the magnetic field generator comprises a plurality of field coils extending about the chamber. 18. The apparatus of statement 17 wherein the magnetic field generator further comprises a plurality of mirror coils operably associated with the field coils. 19. The apparatus of statement 18 wherein the magnetic field generator further comprises a current coil positioned along a principle axis of the chamber to induce an azimuthal electric field within the chamber. 20. The apparatus of statement 19 wherein the current coil is a betatron flux coil. 21. The apparatus of statement 20 wherein the betatron flux coil comprises parallel windings of a plurality of separate coils. 22. The apparatus of statement 15 wherein the magnetic field generator is tunable to produce and control an electrostatic potential well. 23. The apparatus of statement 22 wherein the confinement system further comprises a control system coupled to the magnetic field generator. 24. The apparatus of statement 14 wherein the plasma source comprises a plurality of background plasma guns oriented to inject a background plasma along a principle axis of the chamber toward a mid-plane of the chamber. 25. The apparatus of statement 24 wherein the plasma source further comprises ion beam injectors to inject ion beams into the chamber. 26. The apparatus of statement 25 wherein the ion beam injectors are adapted to inject electric charge neutralized ion beams into the chamber. 27. The containment device of statement 14 wherein the chamber is generally cylindrical. 28. The containment device of statement 14 wherein the chamber is generally annular. 29. A plasma confinement system comprising a chamber, a magnetic field generator in operable relation with the chamber, a field reversed topology magnetic field, the field reversed magnetic field formed at least in part by a magnetic field generated by the magnetic field generator; an electrostatic field within the chamber produced and controlled by tuning the magnetic field generated by the magnetic field generator, and a plasma comprising electrons and ions confined within the chamber, wherein a plurality of plasma ions are confined by the field reversed magnetic field and a plurality of plasma electrons are electrostatically confined by the electrostatic field. 30. The system of statement 29, wherein the plurality of plasma ions and electrons are substantially classically contained. 31. The system of statement 30, wherein the plurality of plasma ions are substantially non-adiabatic. 32. The system of statement 31, wherein the plurality of plasma ions are substantially energetic and orbit in large radius orbits within the chamber. 33. The system of statement 32, wherein the radius of the ion orbits exceeds wavelengths of anomalous transport causing fluctuations. 34. The system of statement 32, wherein the ion orbits are substantially betatron orbits. 35. The system of statement 32, wherein the ion orbits are substantially in a diamagnetic direction. 36. The system of statement 35, wherein ion drift orbits are substantially in the diamagnetic direction. 37. The system of statement 29, wherein field lines of the magnetic field generated by the magnetic field generator substantially extend in a direction along a principle axis of the chamber. 38. The system of statement 29, wherein the field reversed magnetic field comprises a combination of first and second magnetic fields, wherein the first magnetic field is generated by the magnetic field generator. 39. The system of statement 29, wherein the electrostatic field forms an electrostatic potential energy well. 40. The system of statement 39, wherein the plurality of plasma electrons are substantially contained within the electrostatic potential energy well. 41. The system of statement 29, wherein the field reversed magnetic field produces Lorenz forces on the plurality of plasma ions that dominate electrostatic field forces to magnetically contain the plurality of plasma ions. 42. The system of statement 29, wherein the electrostatic field is adapted to direct ion drift orbits of the plurality of plasma ions in a diamagnetic direction. 43. The system of statement 38, wherein a second magnetic field having a poloidal topology is formed due to rotation of the plasma. 44. The system of statement 29, further comprising a current coil positioned along the principle axis of the chamber and an azimuthal electric field generated within the chamber by the current coil. 45. The system of statement 44, wherein the magnetic field generator comprises a plurality of field coils extending about the chamber and first and second mirror coils positioned adjacent opposing ends of the current coil, wherein the first and second mirror coils increase the magnitude of the magnetic field generated by the magnetic field generator adjacent the first and second ends of the current coil. 46. The system of statement 44, wherein the current coil comprises parallel windings of a plurality of separate coils. 47. The system of statement 45, wherein the chamber is substantially cylindrical. 48. The system of statement 45, wherein the chamber is substantially annular. 49. The system of statement 45, further comprising ion beam injectors injecting ion beams into the field reversed magnetic field in a direction substantially perpendicular to field lines of the field reversed magnetic field, wherein the field reversed magnetic field traps and bends the ion beams into orbits within the chamber. 50. The system of statement 49, wherein the ion beams are self polarized. 51. The system of statement 29, wherein the plasma comprises at least two different ion species. 52. The system of statement 29, wherein the plasma comprises an advanced fuel. 53. A method of confining a plasma having electrons and ions, the method comprising the steps of: magnetically confining a plurality of plasma ions, and electrostatically confining a plurality of plasma electrons. 54. The method of statement 53, further comprising the steps of generating a magnetic field within a confinement structure, the magnetic field having a field reversed configuration (FRC) topology, generating an electrostatic field within the confinement structure, the electrostatic field forming a potential energy well, and confining the plurality of plasma ions magnetically within the FRC magnetic field and the plurality of plasma electrons electrostatically within the potential energy well. 55. The method of statement 54, further comprising the step of substantially classically containing the plurality of plasma ions. 56. The method of statement 55, further comprising the step of substantially classically containing the plurality of plasma electrons. 57. The method of statement 55, wherein the step of substantially classically containing the plurality of plasma ions includes containing the ions within the confinement structure for a period of time greater than a burn time of the plasma. 58. The method of statement 55, wherein the plurality of plasma ions are substantially non-adiabatic. 59. The method of statement 58, wherein the plurality of plasma ions are substantially energetic. 60. The method of statement 58, further comprising the step of orbiting the plurality of plasma ions within the FRC magnetic field in large radius betatron orbits wherein the orbit radius exceeds the wavelengths of anomalous transport causing fluctuations. 61. The method of statement 54, wherein the step of magnetically confining the plurality of plasma ions includes causing the plurality of plasma ions to orbit within the FRC magnetic field due to Lorenz forces acting on the plurality of plasma ions. 62. The method of statement 61, further comprising the step of orbiting the plurality of plasma ions in an diamagnetic direction. 63. The method of statement 62, further comprising the step of substantially directing ion drift orbits in the diamagnetic direction. 64. The method of statement 54, further comprising the step of generating an applied magnetic field within the confinement structure. 65. The method of statement 64, further comprising the step of rotating the plasma and forming a magnetic self-field. 66. The method of statement 65, further comprising the step of combining the applied magnetic field and the magnetic self-field to form the FRC magnetic field. 67. The method of statement 54, further comprising the step of cooling the plurality of plasma electrons. 68. The method of statement 54, further comprising the step of forming fusion product ions. 69. The method of statement 68, further comprising the step of transferring energy from the potential energy of the electrostatic potential well to the fusion product ions. 70. The method of statement 54, wherein the plasma comprises advance fuel ion species. 71. The method of statement 53, further comprising the steps of generating an applied magnetic field, and manipulating the applied magnetic field to produce and control an electrostatic field. 72. A method of forming a field reversed configuration magnetic field within a reactor chamber comprising the steps of generating an applied magnetic field in a reactor chamber in which plasma is filled, injecting ion beams into the applied magnetic field within the reactor chamber, forming a rotating plasma beam within the chamber having a poloidal magnetic self-field, applying an azimuthal electric field to increase the rotating velocity of the plasma beam to a velocity at which the magnitude of the magnetic self-field within the plasma beam overcomes the magnitude of the applied magnetic field causing field reversal, and joining field lines of the applied magnetic field and the magnetic self-field in a combined magnetic field having a field reverse configuration (FRC) topology. 73. The method of statement 72 wherein the step of generating the applied magnetic field includes energizing a plurality of field coils extending about the chamber. 74. The method of statement 73 wherein the ion beams are injected substantially transverse to the applied magnetic field. 75. The method of statement 74 wherein the step of injecting the ion beams further comprises the steps of neutralizing the ion beams, draining the electric porlarization from the neutralized ion beams, and exerting a Lorentz force due to the applied magnetic field on the neutralized ion beams to bend the ion beams into betatron orbits. 76. The method of statement 72 further comprising the step of increasing the magnitude of the applied magnetic field to maintain the rotating beam plasma at a predetermined radial size. 77. The method of statement 72 wherein the step of applying the electric field includes the step of energizing a betatron flux coil within the chamber. 78. The method of statement 77 further comprising the step of increasing the current through the flux coil to accelerate the rotating plasma beam to fusion level rotational energy. 79. The method of statement 78 further comprising the steps of injecting ion beams of fusion level energy into the FRC and trapping the beams in betatron orbits within the FRC. 80. A method of forming a field reversed configuration magnetic field within a reactor chamber comprising the steps of generating an applied magnetic field in a chamber, injecting plasma into the applied magnetic field within the chamber, applying an azimuthal electric field within the chamber causing the plasma to rotate and form a poloidal magnetic self-field, and increasing the rotational velocity of the plasma to increase the magnitude of the magnetic self-field within the plasma to a level that overcomes the magnitude of the applied magnetic field causing field reversal, and joining field lines of the applied magnetic field and the magnetic self-field in a combined magnetic field having a field reverse configuration (FRC) topology. 81. The method of statement 80 wherein the step of generating the applied magnetic field includes energizing a plurality of field coils and mirror coils extending about the chamber. 82. The method of statement 81 further comprising the step of increasing the magnitude of the applied magnetic field to maintain the rotating plasma at a predetermined radial size. 83. The method of statement 82 wherein the step of applying the electric field includes the step of energizing a betatron flux coil within the chamber. 84. The method of statement 83 further comprising the step of increasing the current through the flux coil to accelerate the rotating plasma to fusion level rotational energy. 85. The method of statement 84 further comprising the steps of injecting ion beams of fusion level energy into the FRC and trapping the beams in betatron orbits within the FRC. 86. The method of statement 85 wherein the step of injecting the ion beams further comprises the steps of neutralizing the ion beams, draining the electric porlarization from the neutralized ion beams, and exerting a Lorentz force due to the applied magnetic field on the neutralized ion beams to bend the ion beams into betatron orbits. While the invention is susceptible to various modifications and alternative forms, a specific example thereof has been shown in the drawings and is herein described in detail. It should be understood, however, that the invention is not to be limited to the particular form disclosed, but to the contrary, the invention is to cover all modifications,equivalents, and alternatives falling within the spirit and scope of the appended claims. increasing the rotational energy of the plasma to increase the magnitude of the self-field to a level that causes the formation of a magnetic field within the chamber with field reversed topology. The method of claim 1 further comprising the step of creating a magnetic guide field with axially extending field lines within the chamber. The method of claim 2 wherein the step of increasing the rotational energy of the plasma includes increasing the rotational energy of the plasma to increase the magnitude of the self-field to a level that overcomes the magnitude of the guide field causing field reversal. The method of one of claims 1-3 wherein the step of causing the plasma to rotate within the chamber includes creating an azimuthal electric field within the chamber and applying ponderomotive forces from an azimuthal electric field to the charged particles. (b) creating a azimuthal electric field includes increasing current running through a betatron flux coil concentric with a principle axis of the chamber, and accelerating the rotating plasma to fusion level rotational energy by increasing the rate of change of the current running through the betatron flux coil. The method of claim 2 wherein the step of creating the guide field includes energizing a plurality of field coils and mirror coils extending about the chamber. The method of claim 3 further comprising the step of increasing the magnitude of the guide field to maintain the rotating plasma at a predetermined radial size. The method of claim 1 further comprising the step of accelerating the rotating plasma to fusion level rotational energy. The method of claim 8 further comprising the steps of injecting ion beams of fusion level energy into the magnetic field with field reversal within the chamber and trapping the beams in betatron orbits within the chamber. (b) creating an electrostatic well within the chamber, and magnetically confining ions within the magnetic field having field reversed topology, and electrostatically confining electrons within the electrostatic well. (b) forming fusion product ions and exiting the fusion product ions from the magnetic field with field reversed topology in an annular beam. The method of claim 1 wherein the rotational energy of the plasma is increased to a range of about 75 eV to 125 eV. The method of one of claims 5-8 wherein the rotational energy of the plasma is increased to a range of about 100 keV to 3.3 MeV. injecting the ion beams orthogonal to a principal axis of the chamber and at a radial position from the principle axis where the plasma is contained within the magnetic field with field reversal.